In recognition of demographic trends and a growing elderly population, KY International has devoted extensive efforts to understanding the physical, psychological and emotional requirements of senior living. Through careful planning, creative concepts and professional construction knowledge, KYI has designed many quality continuing care retirement campuses that offer independent living, assisted living, and skilled nursing facilities. By addressing the needs of the end users, these facilities were designed to create a comfortable and residential-like atmosphere through the use of open courtyards, flowing common spaces and low scale massing. field of architectural design and consistently result in high client satisfaction. An innovative new vision of Hawaiian-style country living set in a paradise of fertile rain forests and blooming gardens. This senior living development offers the elderly assisted living and continuing care facilities as well as duplexes for independent living. The buildings are designed to create and open comfortable and residential-like atmostphere for the elderly inhabitants residing here. Conventiently located, this senior living development offers a diversity of uses within easy walking distance of each other. Designed with attractive environments such as outdoor courtyards where the elderly can gather and enjoy a comfortable and healthy lifestyle. Each building was designed to complement the paniolo lifestyle and architectural character of the surrounding area. Wood facades, gabled roofs and covered verandas were incorporated to create a comfortable and residential-like atmosphere for the elderly inhabitants residing here. 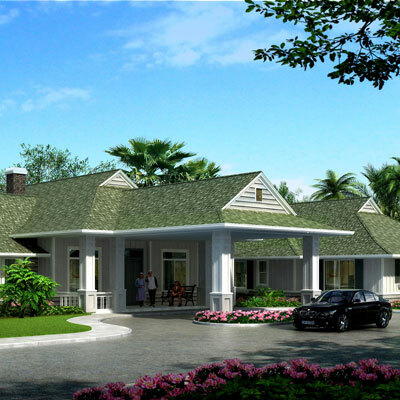 Located on a plateau of 28 acres in Central Oahu, this Continuing Care Campus will be phased to include independent living townhomes and apartments, assisted living units, multi-purpose facilities, agricultrual activities and affordable senior housing. Nestled into the slopes of East Oahu, this Continuing Care Campus offers independent living cottages, apartments, and assisted living units for the elderly.